Benjamin Greenberg of non profit organisation Physicians for Human Rights has posted a really good presentation onto Google Docs that he developed internally to explain the benefits and the hows of internal blogging. 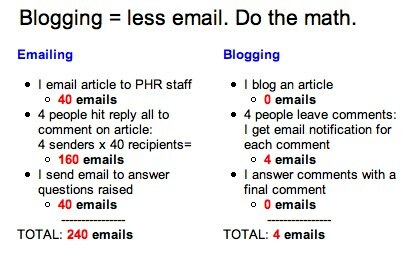 I really like the email argument on the slide pasted here. The more we can siphon off the non-time sensitive stuff into channels that are more suited to them, the more we’ll be able to calm the raging torrent of email that threatens to drown us. And don’t forget to click through on the “review” link on the last slide – a nice reminder of how simple this should be. There are other ways that blogs are better than emails for collaboration, of course – for example, if most of your team collaboration is by email, when team members come and go, new people don’t have a common point of reference for what went on before they arrived. Blogs enable them to gather context quickly. But I like the straightforward simplicity of this presentation. Thanks to Beth Kanter for this find. There are a few assumptions here. One is that people know the blog exists. The other is that people are going to the blog to find the information that has been posted on their own accord. I know we are trying to cut down on the overload of email but even with this scenario the person would more than likely have had to subscribe to an RSS feed or Alert so they would have received another message (or email) letting them know the post has been made. I don’t think we are out of the woods yet in regards to pushing content (or links to content) to people. We still need to let people know that the information has been published. It must be published in a time insensitive format (blog. wiki, cms etc..) because the person who starts next week didn’t get the email containing the content. Agreed - what this means is that behind every assumption we need a process and some discipline, until it becomes a habit (and the assumptions are thereby all shared). Hi Patrick, this is great! In my previous organization, people complained about too many mails, but were adverse to blogging too, as it would take time to write and read. This is very convincing for my point of view that it improves communication - even for the people who can’t cope. Will try to reblog this!